This article is about the Mario Party items. For more uses of the word "Orb", see Orb (disambiguation). Orbs (known as Capsules in Mario Party 5) are special items found in the Mario Party series, in Mario Party 5, Mario Party 6, and Mario Party 7. However, in Mario Party 8, they are replaced by Candy, which are used by a player only on themselves. Hexes from Mario Party DS are similar, in that they can be laid down on spaces. Capsules are seen in Mario Party 5. Players receive capsules from capsule machines for free. Capsules are never obtained through a purchase. A player may use the capsule on themselves for a certain number of coins, and consequences will take effect immediately. For example, a player can use a Mushroom Capsule for five coins, then immediately roll two Dice Blocks. Players can also use capsules on themselves even if the effects would be negative. A player can also throw a capsule up to ten spaces ahead, where the space will become a Capsule Space. Thereafter, any player landing on that space will be subjected to the effect. If a player did not wish to spend five coins to use the Mushroom Capsule, they may throw it onto a space ahead of them. As capsules cannot be thrown backwards, there is always a certain risk in placing one on the board. If used on a player, the capsule will cost a certain amount of coins to activate, ranging from 5-20 in most cases. Orbs are available in Mario Party 6 and Mario Party 7. Specific Orbs can be purchased from an Orb Shop, and random ones can be obtained from Orb Spaces for free whenever a player passes one. Some Orbs, such as the Mushroom Orb, can be used on the player, always for free. Some Orbs, such as the Spear Guy Orb, can be thrown onto a space to create a Character Space. Orbs can be thrown up to five spaces ahead or backward. Unlike with a Capsule Space, a character is immune from the negative effects of the spaces they (or their teammates) create; instead, they earn five coins for landing on them. 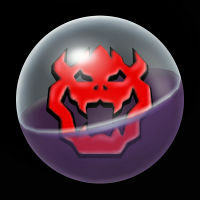 Some Orbs, such as the Zap Orb, can be thrown onto a space to create a Roadblock. These affect any player who passes by the space (not just those who land on it) and the effects occur immediately, though, unlike other Character Spaces, the space will revert to normal after activating once. Players are immune from effects of Roadblocks they place. This page was last edited on October 28, 2018, at 19:59.